Summary: Although it’s far from perfect, it’s a thought provoking thriller that could appeal to the masses easily with its surprising plot twists. First off, I’d like to say the plotline to Fracture is excellent. The film is centred around a disgruntled husband Ted Crawford (Anthony Hopkins) who after seeing his wife cheating on another man Rob Nunally (Billy Burke) shoots her. After he waits for the police to arrive, he signs a written confession admitting to the crime. The story takes an immediate twist after he pleads not guilty in court. His legal opposition Willy Beachum (Ryan Gosling) fails to gain any evidence, the story soon unravels. Willy’s new job relies on him finishing this final case for his former employers, which eventually builds into an obsession to get Ted Crawford into jail. Despite the films strong opening, the middle grows a little stagnant, developing a love interest between Willy and his new boss. After the initial surprise of the police being unable to unearth the murder weapon, and repeat searches and viewing of evidence are generally all filler and remarkably dull. 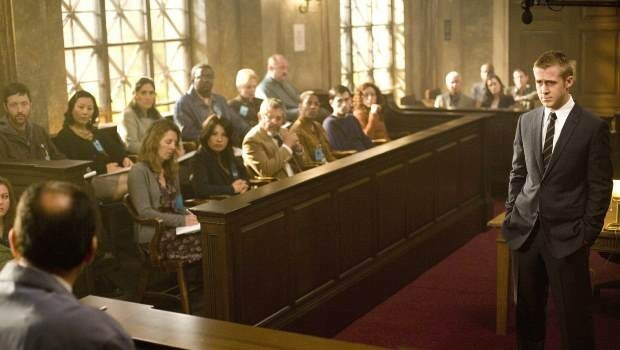 The only real moments of interest are actually in the courtroom. The scene where Ted Crawford reveals his arresting officer Rob was having an affair with his wife is a highlight, with a resulting second scuffle between the pair showing spontaneity at its finest. The mind games played throughout the film are a little humdrum; also it does allow us to see the confidence behind Crawford’s character. Such additions as Crawford hiring his own private investigator are never really brought into the limelight. Yet the decision to create a character that defies the common features of every murderer gives the film an interesting edge, working well with the narrative. Despite the well written plot, Fracture’s flaws are rather transparent. Ted Crawford seems to be married to a forty year old (In spite of the fact he’s 70), whilst he also develops the highly annoying trait of frequently winking as every possible chance (It’s cringe worthy by the end of the film). Ryan Gosling fits into the cocky lawyer easily, yet he cannot muster the same sort of passion when frustration towards the trial kicks in. It’s an enjoyable film, I can’t think of anything that follows a similar plotline. Although it’s far from perfect, it’s a thought provoking thriller that could appeal to the masses easily with its surprising plot twists. Worth a watch for sure, not something that you’ll fall in love with though.